PHILADELPHIA, PA--(Marketwire - Aug 18, 2012) - Philadelphia children are getting a free day of fun at the zoo today along with new teddy bears and more thanks to "Travelodge's The Great Sleepy Bear Swap." The first of five one-day events to be held across the country between now and mid-October, Travelodge's The Great Sleepy Bear Swap invites children and their families to donate a gently-used stuffed animal to charity in exchange for free kid's admission to the zoo and a brand new Sleepy Bear teddy bear. While free admission is limited to the first 100 children who bring a donation, everyone at the zoo is able to participate in fun-filled activities including face painting and drawing contests along with giveaways such as temporary paw print tattoos, National Geographic activity books and Sleepy Bear masks. A keeper from the zoo will also be on hand to educate children about bears and the role they play in the wild. "For over 75 years, the Travelodge hotel brand has been delivering memorable experiences and giving back to the communities where our hotels are located," said Mark Young, Travelodge brand senior vice president. 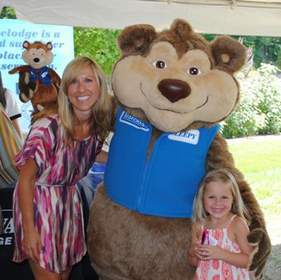 "With Travelodge's The Great Sleepy Bear Swap, we're continuing both of these great traditions while giving everyone in the area a chance to come out and say hi to Sleepy Bear, our beloved mascot." Stuffed animals gathered from the events will be donated to Stuffed Animals for Emergencies (S.A.F.E. ), a national organization that cleans and redistributes the toys to children in need. For every stuffed animal donated at the event, the Travelodge hotel brand will match it with a donation of three brand new Sleepy Bear teddy bears to the Starlight Children's Foundation, up to 1,500 bears. Starlight Children's Foundation is a signature charity of Wishes by Wyndham, the philanthropic foundation of Wyndham Worldwide, which includes Travelodge and parent company Wyndham Hotel Group. "For many children, the gift of a stuffed animal is a simple gesture that can help brighten their day, especially when you're talking about children facing severe illness and other hardships," said Young. "Starlight and S.A.F.E. are both organizations that do great work with children across the country and we're delighted to be able to support them through these events." Young also announced that the Travelodge brand would make a $10,000 donation through the Association of Zoos and Aquariums in support of black bear conservation. Travelodge's The Great Sleepy Bear Swap heads to the Dallas-Fort Worth Zoo on Saturday, September 8, followed by events in Los Angeles, Miami and San Francisco. Additional details, including dates and times for all upcoming events, are available at www.Travelodge.com. Part of Wyndham Hotel Group, the Travelodge® brand is a chain of more than 430 economy hotels located throughout the U.S. and Canada designed to keep guests close to adventure at an affordable price, no matter where their travels take them. Standard amenities include free Wi-Fi and complimentary "Bear Bites" continental breakfast. Many hotels also offer fitness centers and swimming pools. U.S. hotels offer the opportunity to earn and redeem points through Wyndham Rewards®, the brand's guest loyalty program. Each Travelodge hotel is independently owned and operated under franchise agreements with Travelodge Hotels Inc., a subsidiary of Wyndham Hotel Group and parent company Wyndham Worldwide Corporation (NYSE: WYN). Reservations and information are available by calling 1-800-525-4055 or by visiting www.travelodge.com. For more information about hotel franchising opportunities visit www.whgdevelopment.com. Travelodge's The Great Sleepy Bear Swap lets children donate a stuffed animal to charity in exchange for a brand new Sleepy Bear teddy bear and free admission to the zoo.